Your site will consist of a number of folders and files that are code that will talk to one another to be able to display what you want to your users. But before we can display a site, your files need a place to be stored and built. The place they are stored is called a server. 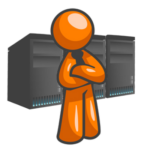 Servers also hold the databases that your files need to work. Anyone can provide a server. Servers need to be monitored and maintained in order to be able to keep all the stored files working optimally and displaying sites. It is a hosting company’s business is to maintain servers. Hosting companies maintain files with equipment that can offer things like unlimited space, redundancy and guaranteed up time. Site owners, like you and I, pay hosting companies a fee (varies from monthly to annual to larger plans) to keep our files safe, running smoothly and available to our users to see when they visit our sites. So, a host is where the server is and hosting is the service you pay for to have your things stored. Your next step to building a website or blog is to acquire hosting. Two of the three simple options below are available for you right here with US for your convenience. Anyone who knows US, also knows that we like the win-win business philosophy. It is our opinion that the options with US are the best options. They offer the biggest bang for your buck. The quick, simple, low-cost way to get your website or blog. 2. Host with our Top Web Hosting Partner. Another low-cost option with no commitments to US. The best part is, the price you get hosting with US or by using our top web hosting partner links, are the same as going directly to the hosting company – and often cheaper! Win-win! 3. Find Your Own Hosting. An educated consumer is our BEST customer. Also a great option for those with other existing sites. We have already done hours of research – we know there are both good and bad reviews regarding any and all web hosts. We don’t feel it is needed, but you are more than welcome to spend more time researching other hosting companies on the internet. The bottom line is that everyone online needs hosting. As much as we would love to have you as one of our hosting clients, where you purchase your hosting is not as important as ensuring that you host with a company you can trust is looking out for your best interest regarding cost, service, security and support. When it comes to hosting, cheaper is NOT always the best deal.